Coordination of Benefits, or COB, is a benefit claim procedure developed by the Canadian Life and Health Insurance Association (CLHIA) for individuals covered under two or more Health and/or Dental Plans. Applying this procedure ensures that you and your dependents receive the maximum eligible benefits available from all plans under which you are covered. 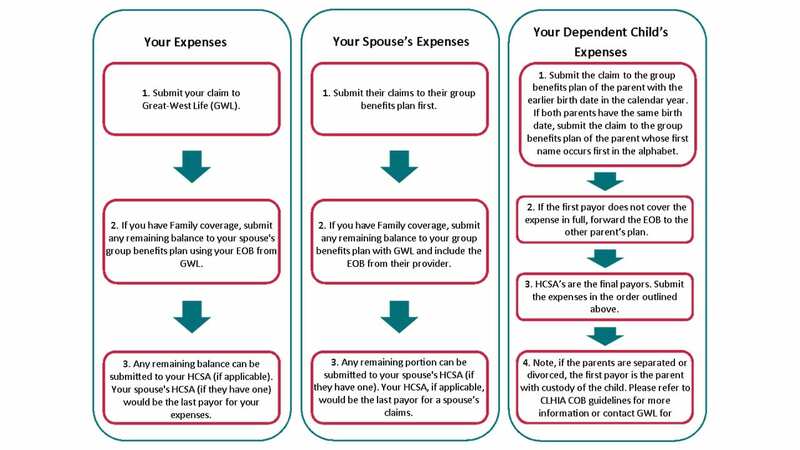 It also outlines the method used for determining where to submit your claims first. The Explanation of Benefits (EOB) is an important document in the application of COB. An EOB (also called a payment summary) is a letter from the insurance company which is sent to you with the claim reimbursement or available on GroupNet when the claim is submitted online. It outlines the amount of expenses and how much has been reimbursed. For drug claims paid via your drug card, your pharmacy receipt is considered your EOB. Through the voluntary HUB Select Program, you are eligible for a variety of products and services including the MyCare Health Benefit Option (MyCare HBO). MyCare Health Benefit Option provides affordable and timely access to world-renowned Mayo Clinic expertise in the event of a serious illness or major orthopedic condition. Safeguard your family’s health with MyCare. Visit the HUB Select website for more information at http://select.hubinternational.com/selectredriver/. The LifeWorks website offers a wealth of information and resources to help you make the most of all aspects of your life. For the month of November, LifeWorks is featuring a suite of resources called Caregiving. Caregiving features resources and tools to support caregivers of all ages, from the sandwich generation to millennials who are caring for older relatives. Be sure to visit www.lifeworks.com to take advantage of the 2018 content, including videos, podcasts, audio tips and much more. For the RRC EFAP User ID and password, please contact Human Resources Services at 204-632-2319, refer to one of the EFAP posters around campus, or click here.